Does increased reliance on renewable energy mean more expensive electricity bills in the US? Over the past couple of years, we’ve been pointing to examples where states with the most renewables pay the lowest electric rates, and now a study confirms the pattern. The 10 states with the largest proportion of renewable energy pay less for electricity than the national average and well below states that have the least renewable energy, according to DBL Investors. And with costs for solar and wind trending further down, this gap will only strengthen. When renewables were first introduced to the market, electricity prices were slightly higher, but those days are over. States with the most fossil fuels have the most expensive electricity, they say. States with cheapest renewable energy: California, Iowa, South Dakota, North Dakota, Idaho, Minnesota, Kansas, Oklahoma, Maine, Washington, DC (Hawaii is excluded even with its high proportion of renewable energy because its remoteness dictates energy price more than any other factor). 10 laggard states: Florida, Connecticut, Rhode Island, Delaware, West Virginia, South Carolina, Ohio, Missouri, Tennessee, and Kentucky. Because solar and wind energy are free after construction is completed, the price of renewable energy is based almost entirely on the cost and efficiency of the hardware. As you know, these costs keep declining. In contrast, the cost of fossil fuel-based electricity depends overwhelmingly on volatile commodity prices. So when Republicans, ALEC, and Koch Brother-"think tanks" push legislation to dismantle state Renewable Portfolio Standards because they drive up costs and inhibit the free market with layers of government bureaucracy … that’s a Lie. In fact, the opposite is true. "Your grandfather’s electricity system, a government-sponsored monopoly reliant on conventional and centralized energy sources, is entering the 21st century," says DBL. "The DBL study is correlational – it doesn’t prove that green energy caused prices to drop; it merely shows that green energy states tend to have lower prices. Nevertheless, the accumulating data makes it very difficult to substantiate the claim that renewable portfolio standards increase electricity costs. Including a high proportion of renewable energy in a utility’s mix of sources does not increase prices," says Brian Palmer at the Natural Resources Defense Council. "The Koch machine won’t stop saying so, of course. They tend not to worry about things like "studies" and "research." But you should." Koch Brothers’ Americans for Prosperity: Electricity from renewables and particularly policies that support it are an "attack on a state’s economy. Not only does it take more money from consumers, but it also keeps businesses from expanding and creating jobs." 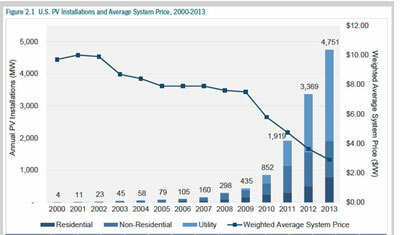 "Solar is becoming a significant burden to both utilities and consumers." Arizona Public Service "spent more than $3.7 million to convince the public that homeowners using solar panels are costing other customers money." 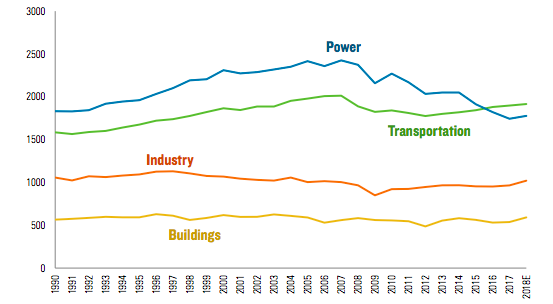 Instead, "The electricity market is ripe for fundamental change," says DBL, because of key economic drivers: the falling cost of renewables; mounting economic benefits from clean energy; and growing uncertainty for carbon-based fuels.